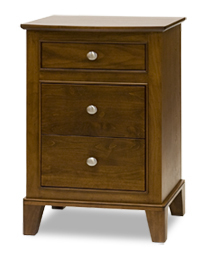 All of our solid wood nightstands are locally made. Most of the nightstands have a selection of drawer configurations. In some cases, customization is available. All dimensions shown are within 1/4″ due to the seasonal effects on wood and the nature of handmade furniture. Please note the Boxwood and Tangent Lines are fully customizable in-house designs. Several of the other designs can still be significantly customized. We can also outfit these nightstands with dimmable under cabinet LED lighting to act as a nightlight and to add a warm ambience to your bedroom.